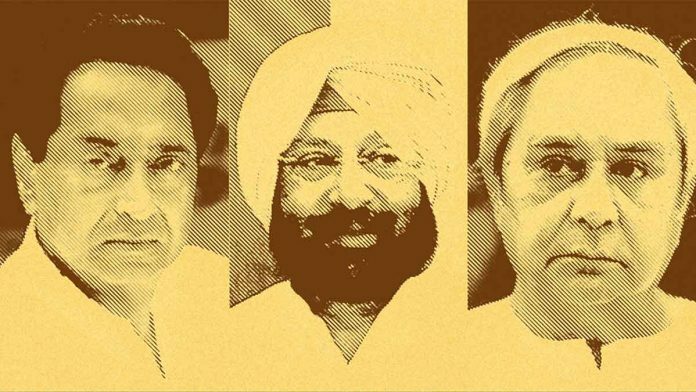 Doon School students continue to dominate India’s politics as Kamal Nath joins contemporaries Naveen Patnaik and Captain Amarinder Singh as chief ministers. New Delhi: When senior Congress leader Kamal Nath was sworn in as the 18th chief minister of Madhya Pradesh Monday, he became the third former student of the elite Doon School to occupy the position at the same time — his contemporaries Naveen Patnaik and Captain Amarinder Singh are the current leaders of Odisha and Punjab respectively. Although Doon School has defined the country’s political elite for aeons, this is the first time that three alumni are CMs simultaneously. Incidentally, Nath, from the 1964 batch, was picked as CM over Jyotiraditya Scindia, who attended Doon 25 years later, despite hailing from the family that founded another prestigious boarding school, Scindia School in Gwalior. The man who made the choice, Congress president Rahul Gandhi, too went to Doon briefly in the early 1980s as a batchmate of Scindia, before being pulled out due to security reasons and was home-schooled. Rahul’s father, Rajiv Gandhi, remains the only prime minister to have attended Doon, and in a way, along with his brother Sanjay, brought this elite network of ‘Doscos’ into vogue in politics, the media and other spheres in the 1970s and 1980s. To be sure, there were political figures like veteran Congress leader Karan Singh, former union minister Dinesh Singh, Murtaza Ali Khan from Uttar Pradesh and Piloo Modi — one of the founding members of the Swatantra Party — who attended Doon school in the 1940s and entered the political arena much before the Gandhi brothers. But it was Rajiv and Sanjay — both of whom passed through Doon in the 1950s and early 60s — who made the ‘Dosco politician’ and the elite clique fashionable. Doscos a few batches apart took over as the face of the young, English-speaking cream of Indian politics. Besides Nath, who was close to Sanjay, former union minister and another Congress leader Mani Shankar Aiyar hailed from the 1957 batch, while former defence minister Arun Singh, who served in Rajiv’s cabinet, was from the 1959 batch. Patnaik, now a multiple-term CM, is from the 1963 batch, while Captain Amarinder was a batchmate of Arun Singh. Other contemporary Doscos who rose to prominence in politics included Akbar Ahmad, ex-MP from Uttar Pradesh, and Vishvjit Prithvijit Singh from Punjab. But it wasn’t just politicians. Journalists, civil servants, diplomats, royal family heirs and business family descendants also formed a part of the close-knit and select circuit. Take for instance former journalist Suman Dubey, currently with the Rajiv Gandhi Foundation, who has been a close confidante of Rajiv Gandhi, Sonia Gandhi and now even Rahul Gandhi. The list of key media personalities of the 1980s would be incomplete without the names of NDTV co-founder Prannoy Roy (1966 batch), senior journalists Swaminathan Aiyar (1958) and Karan Thapar (1971) as well as the head of the India Today Group, Aroon Purie (1960, same year as Rajiv Gandhi). Or take authors like Amitav Ghosh, Vikram Seth and historian Ramachandra Guha — all of whom passed out just a few years apart in the late 1960s and early 1970s. In fact, while their political and social circles may have overlapped as they progressed in life, most of them, being students at the school in the 1960s, crossed paths during their time in the sprawling campus. Living together 24×7 in the boarding school, their interactions were plenty, and the anecdotes of those who went on to become famous have turned into somewhat of a legend in the school. For instance, Aiyar was Rajiv’s senior and says the first time he met him was when the latter came for a swim and sought his permission to enter the pool. Or the friendly banter between Purie and Rajiv when they came together for a batch photo on the occasion of the golden jubilee of the school in 1985. “On that occasion there was a photo opportunity for the class of ’60 with Rajiv. I was on the edge of the frame and the photographer unable to fit me in asked me to come to the centre and kneel in front of Rajiv. No sooner did I do that than Rajiv quipped: ‘See, I have the press at my feet’. And the class of ’60 guffawed,” wrote Purie, adding that he and Rajiv were batchmates but never friends in school. Their ‘houses’ (which also meant the hostels they were allotted) also have their own tales to tell. Both Rajiv and Sanjay Gandhi were in Kashmir House, as was Patnaik. Aiyar and Amarinder Singh — two batches apart — were in Tata House. Ghosh and Guha were together in Hyderabad House. Even though Nath — who was in Hyderabad House — was not in the same hostel as Sanjay , their friendship is legendary and, in fact, is what brought Nath into the Congress. These Doon ‘old boys’ had their own dictionary — nicknames like Nath’s ‘Roly’, and unique slang — which became the vernacular in many a Lutyens’ drawing room. Most of the political class that studied in Doon belonged and continues to belong to the Congress party — which, in a way, is also a reflection of the party’s more urban, aristocratic culture. Some of the younger Congress leaders who surround Rahul Gandhi are also ex-Doscos — be it Scindia or former union ministers of state R.P.N. Singh (1982 batch) and Jitin Prasada (early 1990s). However, the rise of the Bharatiya Janata Party (BJP) and regional parties in the 1980s changed the political landscape, with many new faces dominating the scene. Today, the ruling party features a handful of prominent leaders with the Dosco tag, such as former Rajasthan CM Vasundhara Raje’s son and Jhalawar MP Dushyant Singh (1991 batch), Saharanpur MP Raghav Lakhanpal, as well as Uttar Pradesh MLA Bharatendra Singh. Interestingly, Sanjay Gandhi’s son Varun, the BJP MP from Sultanpur, did not attend Doon — his mother and current union minister Maneka Gandhi sent him to schools like Rishi Valley School in Andhra Pradesh, and The British School in New Delhi. Patnaik’s Biju Janata Dal also has another Dosco among its leaders — Bolangir MP Kalikesh Narayan Singh Deo, whom his batchmates knew as ‘Kally’. With the BJP’s rise in national and state politics, the scales could slowly be tilting. Several senior BJP leaders have now chosen to send their children to the elite school, such as Petroleum and Natural Gas Minister Dharamendra Pradhan, junior Home Minister Kiren Rijiju, as well as the party’s chief strategist in the Northeast and Assam minister Himanta Biswa Sarma. In your summary you forgot to mention one of the the most illustrious journalists – Inderjit Badhwar. Google his name to find out about his achievenents. Doon School stands for values that unify India. We need more of that now.